Aperture 3 users can download the 3.0.1 update that improves 15 called-out features including: upgrading older libraries, importing photos, memory management, face recognition processing, roundtripping, accessing libraries on a network volume, Places, and more. A lot of stuff! But it still doesn't address a couple of things on my list. One complaint I have is that exporting is slower on my MBP 2.5 GHz than it was before. But the problem that drives me crazy is that my IPTC metadata doesn't display properly in Photoshop after an export from Aperture. So I'm happy to see an Aperture 3 update so quickly after its release. 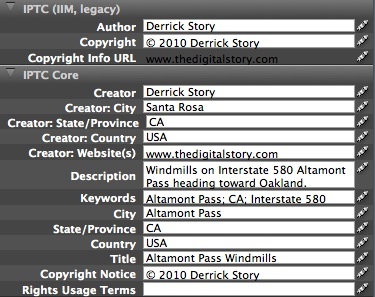 And I'm looking forward to future updates that will smooth things out even more... especially the metadata export. I've been recording quite a bit of video on location (link goes to YouTube movie sample) for Lowepro as part of my photo evangelist work. For the most part, things have gone well. That's only because I've been lucky. Today my luck ran out. When I got back to the room to process and upload the video, I was horrified. Kevin, one of my Lowepro comrades, had just told me about the Magic Lantern Firmware enhancement for the Canon 5D Mark II. It temporarily disables that nasty AGC, allows you to choose between internal or external mics, lets you set the audio levels manually, then provides visual meters so you can monitor your recording in real time. For added protection, enable the camera's A/V jack for audio monitoring with headphones. Needless to say, I was suddenly very interested. I downloaded the firmware, copied it to a CF card with my card reader, and enabled it on the 5D Mk2 by going to Firmware on the menu and hitting OK. The enhancement is only temporary. Once you turn off the camera, it returns to its normal firmware. Very cool. The Magic Lantern site does a great job of explaining all the ins and outs of this wonderful software. I encourage you to read everything, then watch the movie they have embedded on the site. It really explains what's going on. You can download for free, but you'll probably be inspired to hit the donation button after a few uses. I'm going to reshoot the videos tomorrow that I botched today. With the Magic Lantern Firmware, I'm sure things will go much smoother. Looking back, Canon may someday regret its decision not to attend PMA 2010. 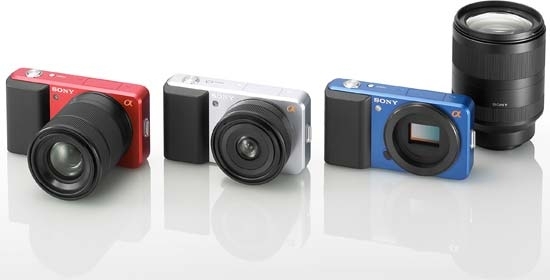 New concept cameras announced by Sony that will compete in the small DSLR market. In addition to its thriving booth atmosphere, Sony announced today its competition to the micro four thirds mirrorless SLRs. Additionally, their flagship DSLR, the Alpha 900, was touted by a series of talks by top professionals such as Andy Katz, and the presentations were impressive. On top of that, Sony released plans for new Zeiss 500mm F4 and 24mm f2 lenses -- solid equipment backed by big marketing dollars. And thanks to a no-show Canon and scaled back Nikon presence, Sony became the star of the show. Panasonic and Olympus aren't just sitting on their lens caps either. Panasonic continues to attract great interest in its Lumix DMC-GF1 and other micro four thirds bodies, plus keeps pushing forward on developing its lens lineup for these bodies. Olympus was showing off its latest entry, the E-PL1, which offers a great feature set, handsome looks, and runs $200 less than its previous micro four thirds offerings. Samsung was also making a big push on the PMA show floor. There was interest in their new high-end compact, the TL500, that features a fast f-1.8 24-72mm zoom (f-1.8 at the wide end), a flip out screen, and Raw capability. Many view this as a competitor to the Canon S90 (although I much prefer the S90's look and feel). I think it's going to be interesting to see how all of this plays out over the coming months. Surely Canon and Nikon will continue to hold their impressive market share. At the same time, however, I wouldn't take my foot off the gas if I were any of these competitors. Sony saw an opportunity with this tradeshow, and they are definitely seizing the moment. Of course the floor wasn't just all serious hardware. Accessory companies such as Joby showed off their latest wares. I had fun with the Gorillapod Magnetic that features three neodymium magnets that really latch on to metal surfaces. Now you have a whole new way to steady your compact camera. 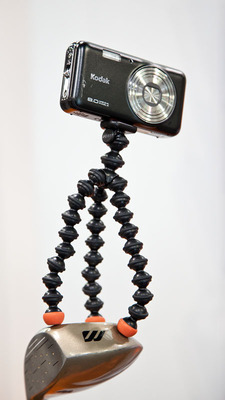 The Joby Gorillapod Magnetic features serious gripping power on metal surfaces. 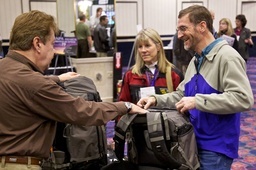 Lowepro, Think Tank, and Tamrac each saw a lot of activity in their respective bag booths. Obviously I was focused on Lowepro (since I am their photography evangelist), and saw good reaction to the new SlingShot series that improves on the already popular design. The Pro Rollers were also getting a lot of attention today. In terms of what wasn't there, a very noticeable omission today was the lack of software of the show floor. In large part I think this was because Adobe chose not to attend the show. But in general, it felt like the trend this year was more about taking pictures than working with them on your computer. I'm sure other things will jump out at me over the coming days. But these were the standouts on my first walk through the expo. I think PMA is still relevant, and many who attended the event today would probably agree. With back to back trade shows to attend (NANPA and PMA), I had two choices -- either fly to Reno, then catch another flight to Anaheim, or map out a road trip. Driving does take more time. 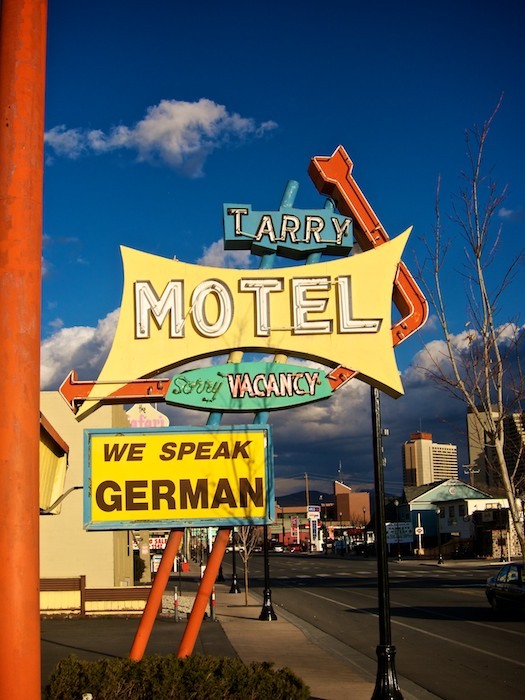 I'm writing this post in Bishop, CA, about halfway between Nevada and S. California. I'll arrive at PMA tomorrow afternoon. On the other hand, I shot 200 images today at wonderful locations such as Convict Lake, Mono Lake, and scenics south of Mammoth Lakes. So sometimes the long way home is the more beautiful route. It sure was today. Foothills above Bishop, CA on Highway 395. Captured with a Canon 5D Mark II with a 24-105mm L zoom lens. 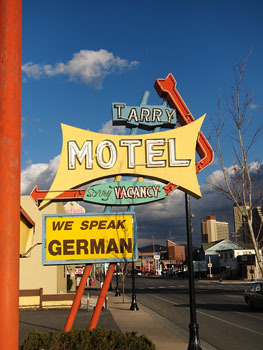 More photos from this road trip are viewable on The Digital Story Flickr page. 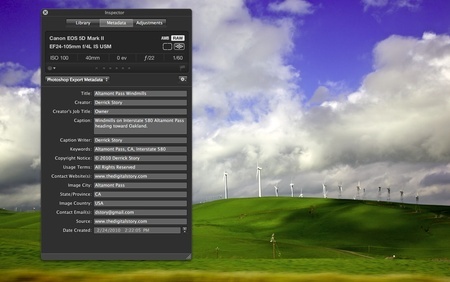 As a Canon S90 shooter, I was thrilled to see this top notch compact listed in Aperture 3's Raw support list. I did a few preliminary tests, and I liked what I saw in Aperture. But then I started to wonder: How does Aperture's Raw processing compare to Canon's Digital Photo Professional? After all, there's lots going on behind the scenes here, including lens correction. Top image processed in Aperture 3, bottom picture in Canon's Digital Photo Professional. Click on image to enlarge. You may recall that I ran a similar test comparing DPP processing to ACR 5.6. In this current test, I tried to take advantage of the unique tools in each application to create the best image possible. I didn't add any sharpening after sampling down, as I normally would, because I wanted to keep the playing field level. This shot was captured handheld at 28mm, f/5.6, ISO 100. 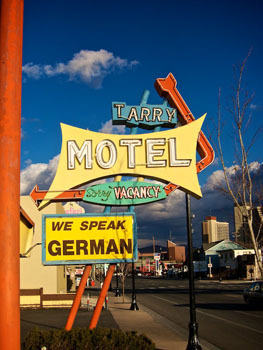 I recorded the photo in Sparks, NV. The top image is processed in Aperture 3. I used the standard Aperture 3 Raw profile for the S90. I then used the following adjustments: Definition, Vibrancy, Levels, Edge Sharpen, and Vignette. You'll notice some distortion in the shot, best illustrated by the orange poll on the left side. Overall, I really liked how Aperture processed this image. It would be nice to have a tool to adjust the distortion in Aperture, but easier asked than programmed, right? 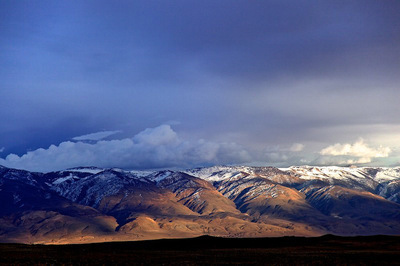 The second image was processed in Canon's Digital Photo Professional. There aren't as many luminance and color controls as in Aperture, but I did have the Lens Aberration Correction control to counter some of the distortion in the image. Interestingly enough, DPP did not correct the distortion as part of the standard Raw processing. I had to enable the Aberration Correction control to straighten out the pole. And it was a bit odd having the Distortion slider hidden behind the Tune button for Aberration Correction. It does work nicely, however. Overall, I really like having all of the various image tools that are available in Aperture 3. But for certain S90 photos that require distortion control, I'll probably open them in DPP first, correct them, then save out as a Tiff for finishing off in Aperture 3 or Photoshop CS4. For everything else, however, I'm going to stick with Aperture 3. Yes you can trim video in Aperture 3, but that's about it. What I needed was a tool for color and luminance adjustments. First I tried roundtripping to iMovie. Quite honestly, that was a disaster. Let's just say that I don't think Aperture and iMovie should see each other any more. I tried to apply filters on export in QuickTime 7. Just too clunky. I even explored some of the free video editors on the Web. Now I know why they are free. Then it dawned on me. I have Photoshop CS4... Extended. Up until now, having the Extended version didn't mean much to me. I'm not a scientist and I haven't delved into 3D yet. But I can import video, add adjustment layers to it, then render it out using the standard QuickTime export dialog box. This is exactly what I needed. 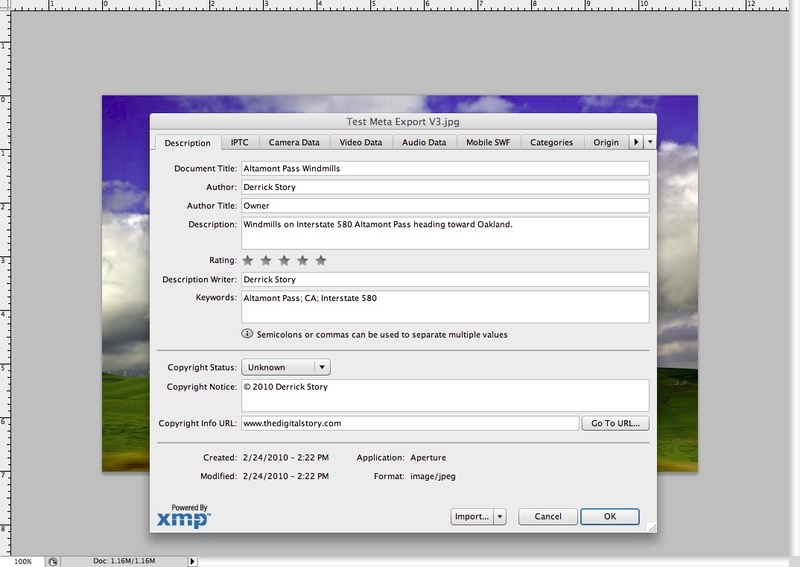 You can pick any frame in your video to view while you make your adjustments. I worked in layers, just as I would normally. But you don't have to. Then simply go to File > Export > Render Video, and save out the adjusted version. Your entire movie will have the luminance and color correction applied. 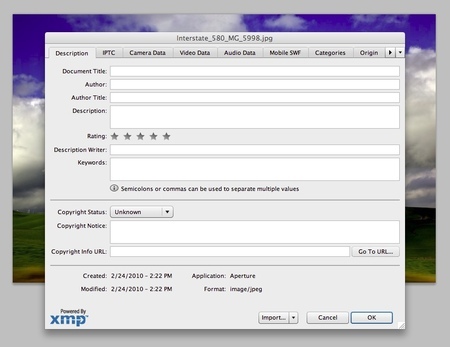 Download video from camera to external hard drive that I use for all of my referenced files. 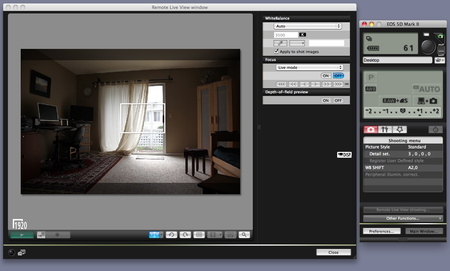 If they don't need any luminance or color adjustments, import them into Aperture as referenced files. If they do need adjustment, correct in Photoshop CS4, render out, then import the corrected movies into Aperture 3 as referenced files. Apply metadata, organize, etc. in Aperture 3. At that point, I would probably copy the uncorrected master movies on to my Drobo and remove them from my referenced hard drive. I'm sure I'll tweak this workflow some more. But for now, I have deadlines to meet. 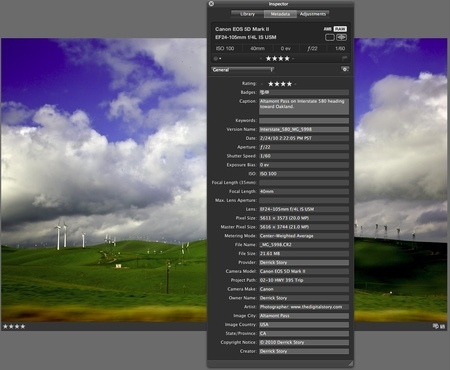 You might be wondering if you can roundtrip to Photoshop CS4 by choosing it for videos in your Aperture 3 preferences. Well, yes and no. Aperture does send the video to Photoshop and it opens correctly. But, you can't use the Save command to roundtrip back. So you have to Export > Render and new file anyway. So, in my opinion, this workflow isn't ready for primetime yet. And from what I've read, you can use Photoshop CS3 Extended for this, but you can't listen to the audio. But it's still preserved. All of that being said, I am thrilled to have a way to adjust my videos while still using Aperture 3 as the manager. I'll report more as I discover it. The exhibit hall opened on Tuesday night at NANPA, where Canon, Nikon, Lowepro, and many others displayed their wares. I was working in the Lowepro booth, talking with photographers, taking pictures, and answering questions. As you might suspect in a room of nature photographers, the most popular bag was the Lowepro Pro Trekker 600 AW. As one shooter said, "I need a bag that can hold my camera gear and my personal items when I'm working in the field. 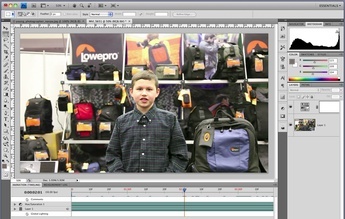 Here's a short video of the Lowepro booth and a photographer giving the Pro Trekker the once over. After 2 years of waiting, we have Aperture 3. And it's beautiful! In this podcast I cover the highlights of this new release, then have 10 tips to help you get started. Red is the Feb. 2010 Photo Assignment. You can read more about how to submit on our Member Participation page. Deadline for entry is Feb. 28, 2010. The TDS Hot Air Balloon Photography Workshop in June 2010 has lost its hot air. The organizers cancelled the event for this year. Ack! So I'm working on a different event in the same time slot. Stay tuned for more information. If you'd like to get on the waiting list for upcoming workshops, please send me email with the subject line: "TDS Workshops." Those virtual camera club members who are on the waiting list get first opportunity to register for newly announced workshops. Attendance is limited to 6 for each TDS Workshop to ensure a personalized experience.